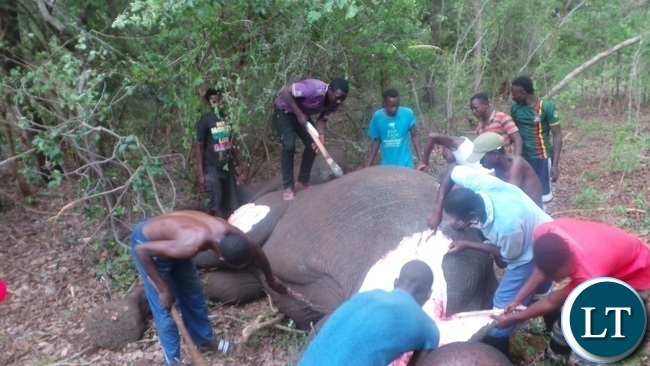 Officers from the Department of National Parks and Wildlife have gunned down an elephant after it charged at an electrician who was fixing an electric fence at a named lodge in Livingstone. National Parks Senior Area Warden, Lewis Daka, says the elephant was gunned down as a control measure to save human lives. Mr. Daka has however appealed to residents, cross border traders and tourists to take precautions whenever they walk through the Mosi-Oa-Tunya National Park. He says officers from the Department of National Parks and Wildlife cannot be everywhere at the same time, hence the need for individuals to be alert at all times. 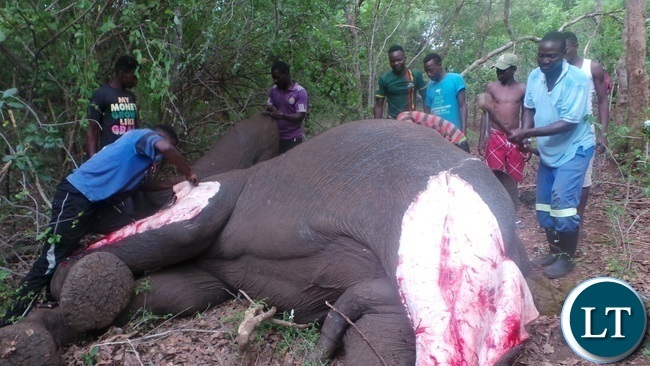 Meanwhile, the number of people killed by elephants in Livingstone, this month, has risen to four after another person was killed near Simoonga area, last week. 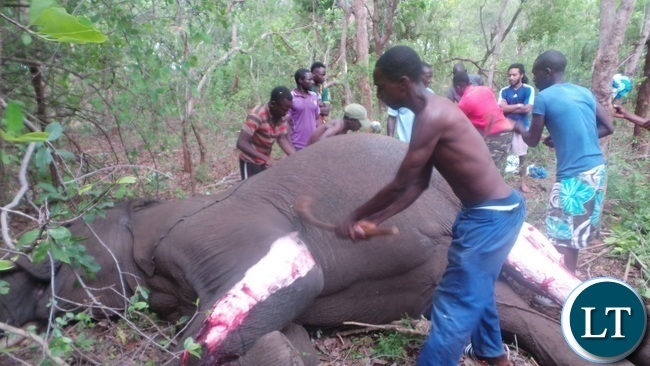 Earlier this month, a security guard and two tourists were killed by elephants in the Mosi-Oa-Tunya National Park. Twalya again, nalelo bwana nama, they are popping champagne in a government jet, villagers have just popped up an elephant, oooh yeeah! People charge at others at Parliament, nothing happens to them. This is IGNORANCE AT ITS BEST!!!!!!!!!!!!!!!! WILDLIFE OFFICERS WHO DON’T SEEM TO UNDERSTAND THAT THEIR ONE DUTY & ONLY DUTY IS TO PROTECT WILDLIFE & educate DAFT HUMAN BEINGS OF HOW TO KEEP SAFE WHILST IN A NATIONAL PARK!!!!! IT MEANS FAUNA & FLORA MUST NOT BE DESTROYED AT ANY COST!!!!!!!!!!! A NATIONAL PARK GIVES FREEDOM TO THE FLORA & FAUNA, Whilst it LIMITS THE FREEDOM OF HUMANS!!!!!!!!!!!! IF THE FRIGGIN DEPT OF WILDLIFE DOESN’T KNOW WHAT IT IS THERE FOR, better to scrap it!! THE BLOODY DIRECTOR SHOULD BE RESIGNING — HECK THIS IS AFRICA, I BET HE WAS FIRST IN LINEUP TO TAKE THE ELEPHANT MEAT!!!!!!! 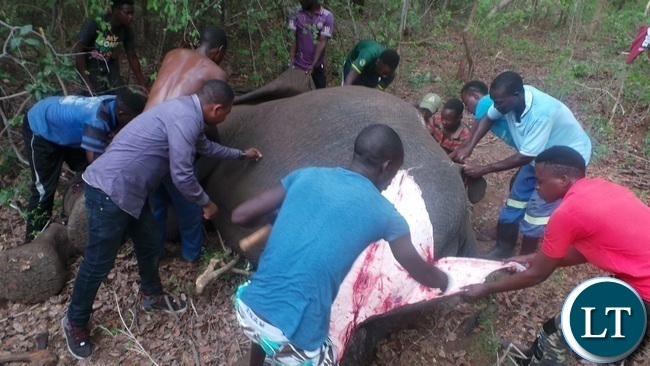 People must be educated better on how to deal with elephants. 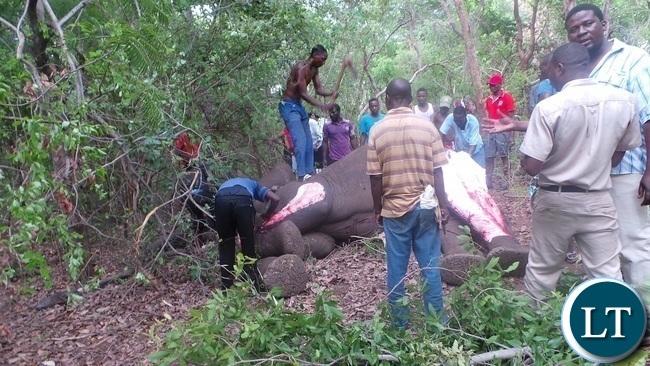 Police officers should use tranquillisers instead of killing these animals that are simply protecting their territory. Unfortunately our government is not bothered in game preservation. They have even allowed big cat hunting. @ Ndobo said it clear, hunger mudala. 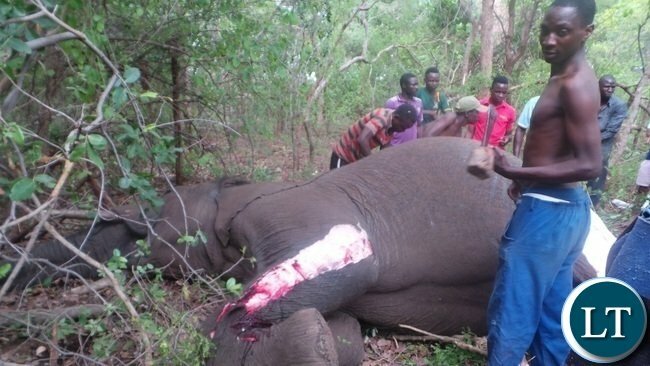 And that’s a child-elephant they killed, don’t have Ivory the ministry claiming. Sinkamba said in Kitwe this morning that human-wildlife conflicts around Livingstone Game Park have escalated in the area due to policy-related problems such as encroachment; poor wildlife conservation strategies; poor livestock , crop and fishing strategies, and others. This what Green Party President Peter Sinkamba was talking about on radio this morning. The issue of man-animal conflict can be reduced by providing policy that guarantees adequate habitat to wild animals, especially stopping encroachment which has resulted in the degradation of habitat quality for animals. Already the local meat butchers have moved in already….are you going to gun down every elephant that charges; why are you not naming the lodge? You have to understand that this area is heavily poached and elephants have long memories, most of these animals are on the offense..especially when you have people trespassing in the park!! I visit Livingstone often, urban sprawl continues with no regard for natural elephant corridors as Peter Sinkamba says. Elephants bring tourists and must therefore be factored in to land use planning. No elephants, no tourists, no jobs – what else has Livingstone got? The Falls – it is a massive magnet that would continue to pull tourists even in the absence of wildlife. Nose demon believed what Ndobo said! He will believe also what HaJayJay would say because they come from together! Pathetic UPND cadres. I believe cropping, the killing of game when their population becomes unsustainable for the environment and/are a danger to humans- is an internationally accepted practice. Its part and parcel of game management. In america, they crop kayotes and alligators, in India the crop elephants as well as in south Africa, in england they encourage fox hunting when populations are too high. Its only in Zambia where we have to enjeculate political filth in every story. The above contributor is that the Rolph shenton we know??? One of the 3 muzungus of chiluba’s first cabinat; Guy Scott, Rev Stan Kristopher and Rolph shenton. Did it come into town or the electrician went into its yard? Selfish humans. So sad to see that animal being skinned. If things continue as they are we will have no more elephants in Zambia. People should realise that it takes so many years for an elephant to grow and reproduce..What difference does it make to elephant population if we gun them down to protect encroaching humans or if they are gunned down by poachers?…Food for thought! 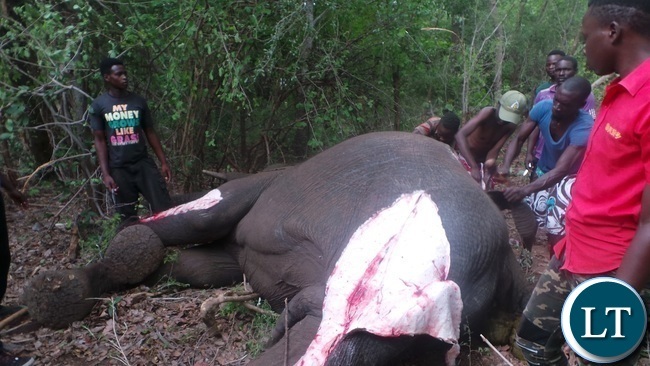 I cannot believe the solution was to kill the elephant!!! Go on Facebook and read the comments on Department of National Parks & Wildlife. This is where some of you should go and post your comments.